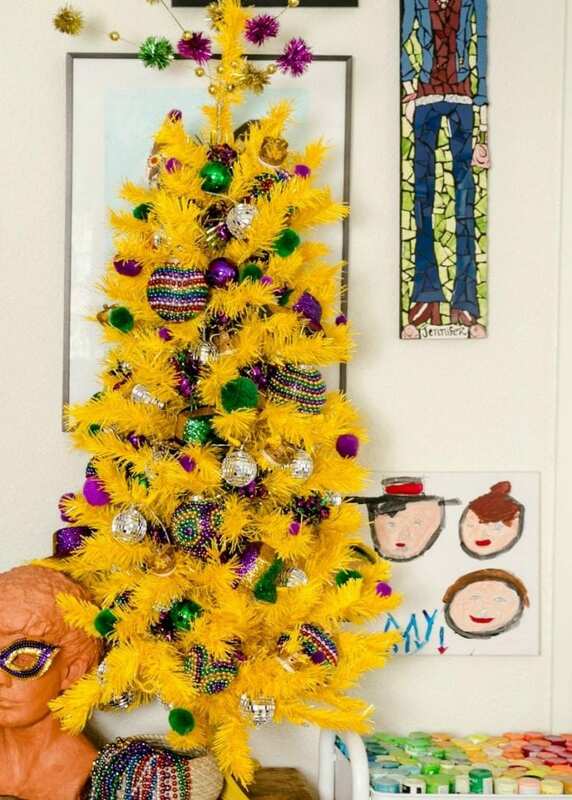 Do you still call it a Christmas tree even when you decorate it for Mardi Gras? This may be one of life’s greatest mysteries. I’m going with yes. Make that a YASSSS, because ya know look at that spiffy tree complete with DIY ornaments. 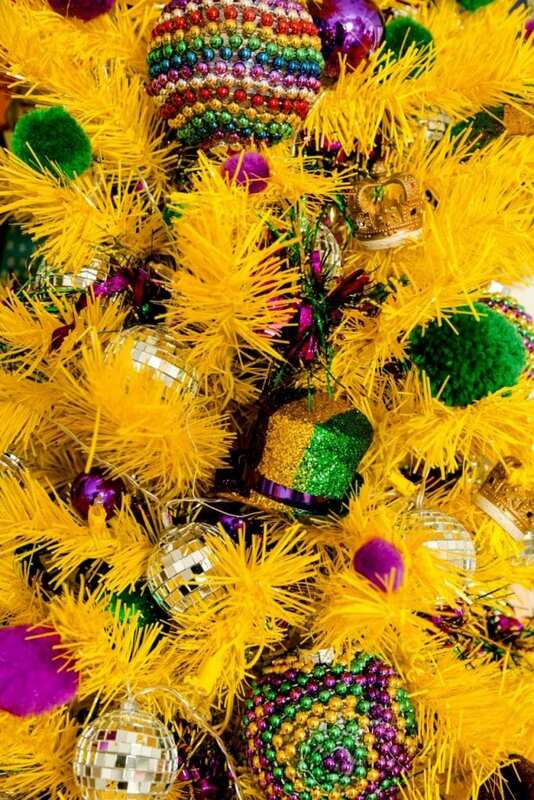 I may have never been to New Orleans for Mardi Gras, but I’m bringing the party to my house with this festive forest of one. Working for Treetopia (I am their paid brand ambassador and they gave me this tree) they keep me on my toes decorating trees WAY BEYOND Christmas. 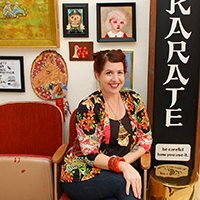 I’ve decorated trees about donuts, celebrated National Thrift Store Day and even decorated one for the Super Bowl. Believe it or not this is not even my first time decorating a tree for Mardi Gras! 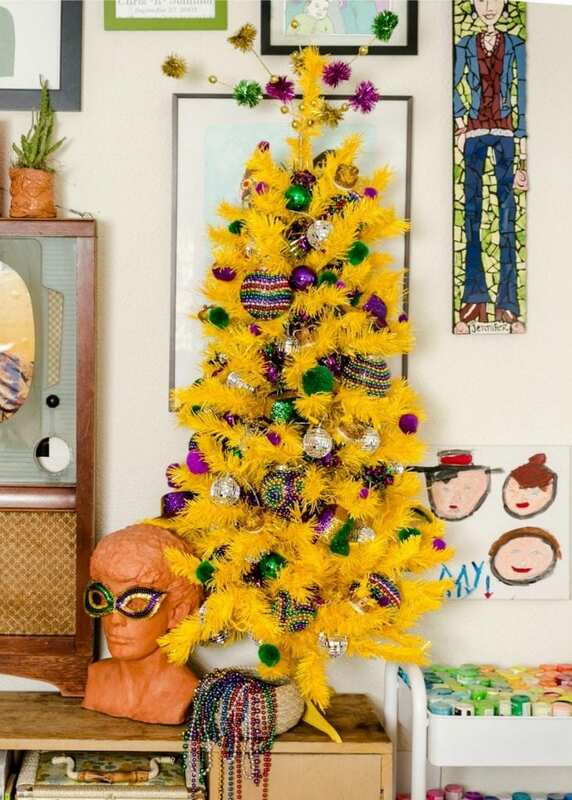 My favorite part about my latest Mardi Gras tree are these DIY beaded ornaments. Sure, they look awesome on the tree but I bet they will look just as cool sitting in a bowl on my table when I’m done. Maybe I’ll even work those rainbow balls into some St. Patrick’s Day decorations. OK everybody, put on your thinking caps because these ornaments are complicated to make. Are you ready? Are you sure? Wrap Mardi Gras beads around ready made ornaments and hot glue into place. The end. 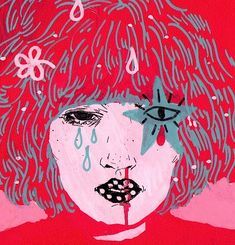 Did I just blow your baby mind out as my kids say? Really though, thats it. 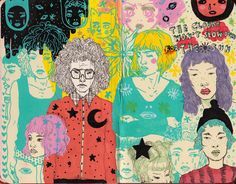 You can switch up the patterns and color combos. Obviously gold, green and purple are the traditional colors of Mardi Gras but don’t be afraid to go rainbow like I did. So there you have it – easy peasy. 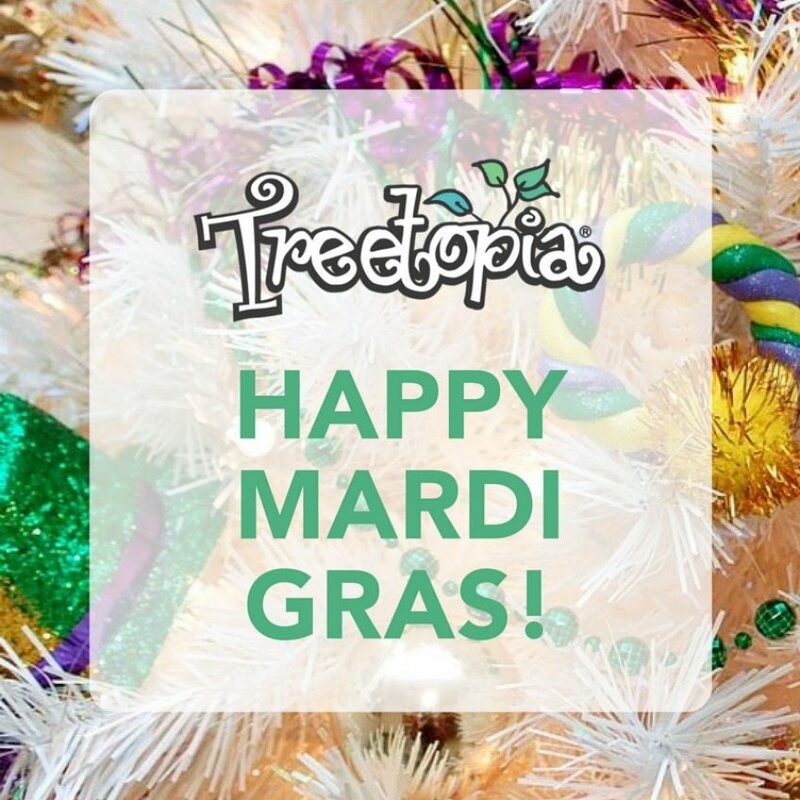 Pop over to the Treetopia blog to see more of my latest Mardi Gras Tree. Is anyone else hungry for gumbo now? Want more Mardi Gras Inspiration? 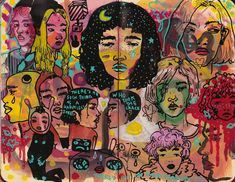 Keep Reading. 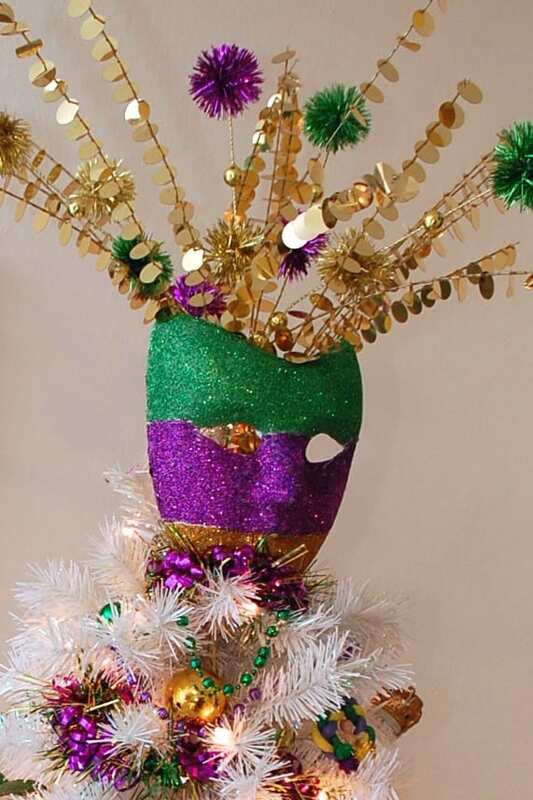 How to Make a Glittered Mask Tree Topper for Your Mardi Gras Tree – This DIY project is about as complicated as the beaded ornaments we just made. 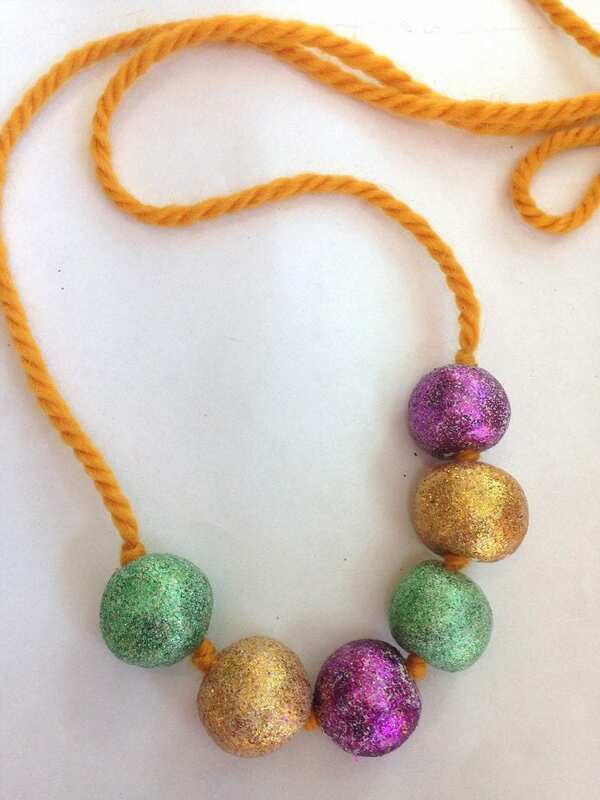 DIY Mardi Gras Bead Necklace for Kids – The wonders of air dry clay never cease. Help kids get into the spirit with these easy beads. 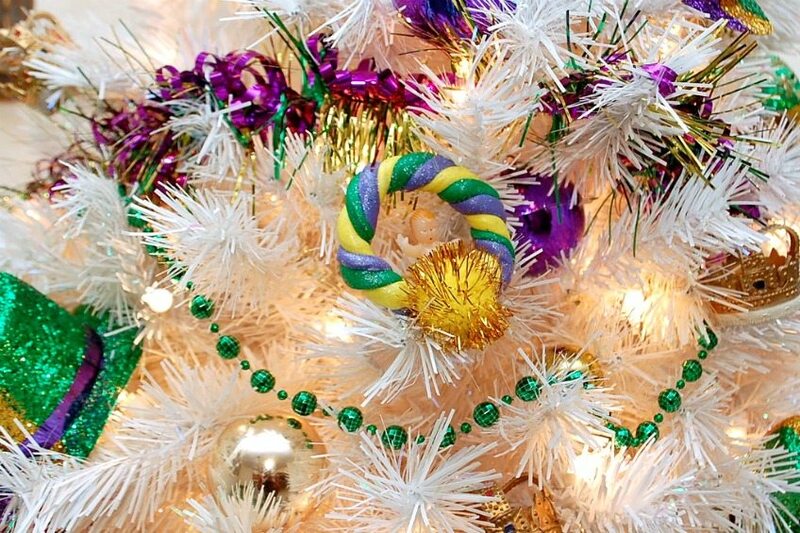 DIY Mardi Gras King’s Cake Ornaments – Bust out the clay and let’s bake a cake. Posted February 1, 2018 & filed under Holidays, Parties.